The first comment (below) is from Sarah Sarah to Rick Shema. We’ve been maintaining about a 9.75-knot average since our departure from Oahu. This has allowed us to out-pace your anticipated progress. In comparing our as-sailed route to your prediction, it appears that we are easting more than you had in mind. Assuming you’ve sent it, we will be retrieving your 2010 Oct 09 update at the same time we’re sending this message, so at the time we’re writing we don’t know if you’ve already recognised this. Unless this is answered in that report, could you advise whether we should adjust our course? We’ll be filing our 00h UTC position report in the next 2-3 hours. Meanwhile, our present position is given below. We’ve been experiencing mostly SW to WSW wind with mixed swells, though more recently predominantly from the NNW at about 0.8-1.0m. We passed through some small squalls this morning, both before and after sunrise. The barometer has been around 1017-1018 mb since about 15 hours ago, however it has climbed to the current 1021 mb over the past four hours. Air temperature has been in the mid-70’s°F, but rose from 78°F to 84°F during the past hour. Sea temperature is 80°F. I received your message yesterday. SOG used in determining weather forecasts is determined by pre-underway discussions, as calculated using last 24 hr position reports, and expected sea state heading to destination. Yesterday you traveled 241nm. With expected head conditions, it may be challenging to maintain that progress. 1. 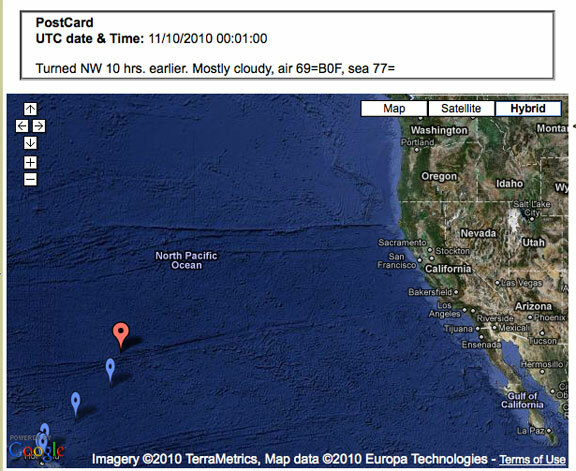 Weather Summary as of 10 October 2010 0200HST. True winds should have veered to NE in gusty 20-25 kt range. A high cell transits to the north of your expected position. Mixed swell as before and wind wave 2.2 to 2.8m. The high center is too far north and moving eastward too fast to catch up to its calm center winds. However may be able to take advantage of lighter conditions in the SW lobe. Note the variety of swell directions mixed with wind waves. It is this chaotic sea state to which we have referred in the past. These are not fun conditions, but if you want to get from Hawaii back to the mainland at this time of year, it is to be expected. On occasion the crossing swells and wind waves combine to create a peak or valley directly ahead. There is no speed adjustment or course change that can consistently mitigate the motion impact of these events. So, you either plug along, and get it over with, or slow right down, essentially heave to. The problem with the latter is that it lengthens your exposure to even worse. In this particular situation, Sarah Sarah is actually taking advantage of a relatively benign weather period. She needs to maintain a 200 to 225 mile per day average (8.5 to 9.25 knots) to stay within Rick’s window. The boat can easily do this. The speed limit is always going to be the level of comfort at which this happens and if the crew can function. We ran at 1810 rpm for the first 24 hours, with a burn rate of about 5.5 US gal./hr. We then kicked it up to 1905-1910 rpm with a burn rate of about 6.5-6.7 US gal./hr. We’ve been running at this rate for the past 34 hours. The 9.75 knot average was over the entire leg up to the time of that report. Our current average for the leg is 9.85 knots. This is based upon the date/time shown below…it may be a few hours before we actually send this message. The first set of data above roughly ties to the smooth water no wind numbers we have from sea trials. 5.5 US gallons an hour is 10% over smooth water. Most of the difference, half a gallon/two liters per hour, will be found in hydraulic and electrical loads. The rest may be prop condition, wave drag, or induced drag from the stabilizers working. Kicking the RPM up to maintain speed tells us sea state and wind has deteriorated. The increased fuel burn, 15 to 20%, will be going partially into a slightly faster boat speed, with the majority being used to offset windage and sea state. Being in the early part of the voyage means they are still almost fully loaded with fuel. Using the 6.5 US gallon figure and 9.85 knots yields a range in excess of 5000 nautical miles without reserve. Fighting headwinds this would be less. If you would like to compare this to the theoretical data click here, and then look at the table at the end of the article. With the wind and sea coming more on the nose we expect progress to slow over the next few days. This entry was posted on Monday, October 11th, 2010 at 4:26 am and is filed under FPB 64 Updates. Both comments and pings are currently closed.